Carrier is keeping more than 1,000 jobs in Indiana -- thanks to "incentives" offered by the state run by Vice President-elect Mike Pence. Carrier released a few more details Wednesday on the deal it struck with President-elect Trump and Pence to keep some jobs from going to Mexico. It is Trump's first major victory, delivering on one of his biggest campaign promises. "The incentives offered by the state were an important consideration," to staying, Carrier said in a statement Wednesday. Pence is the governor of Indiana. Carrier didn't specify what the incentives were. 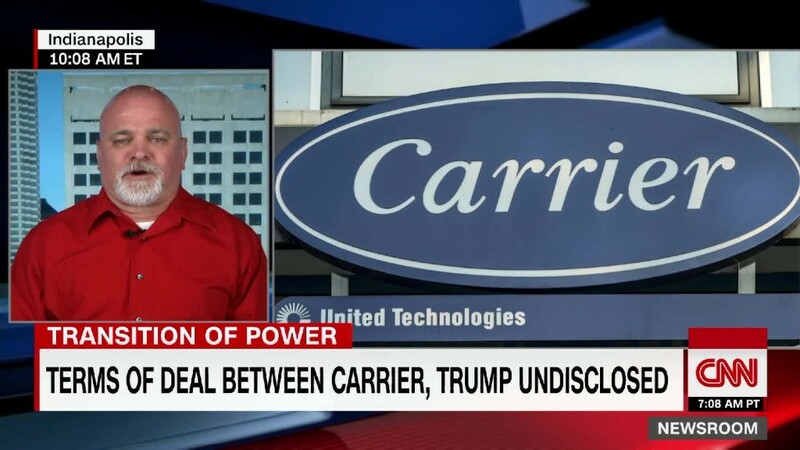 Trump threatened Carrier with stiff tariffs during the campaign, but Carrier's statement depicted a friendlier negotiation. "The incoming Trump-Pence administration has emphasized to us its commitment to support the business community and create an improved, more competitive U.S. business climate," Carrier said. That likely refers to the Trump team's promise to lower the corporate tax rate to 15% from its current 35% -- a promise that Trump's pick for Treasury Secretary, Steve Mnuchin, reiterated Wednesday on CNBC. Carrier said the deal is "preserving more than 1,000 jobs" in Indiana. The Carrier plant in Indianapolis employs 1,400 workers. A nearby plant owned by the same parent company, United Technologies Electronic Controls, employs 700, and had also announced plans to move to Mexico. That plant was not part of the new deal. Carrier became Trump's punching bag early and often on his campaign to the presidency. Trump threatened to hit Carrier with a 35% tariff if it moved jobs to Mexico. The battle between Trump and Carrier symbolized Trump's broader threats to renegotiate trade deals and get tough on Mexico and China. Despite keeping some jobs in America, Carrier emphasized its commitment to free trade. "This agreement in no way diminishes our belief in the benefits of free trade," Carrier concluded in its statement.